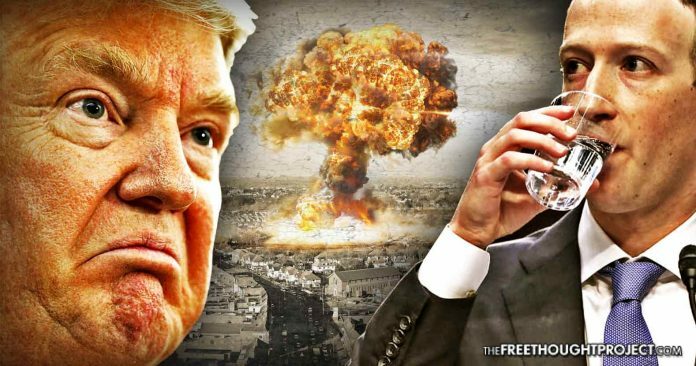 While the mainstream media provides unlimited coverage of Zuckerberg's appearance before Congress, major geopolitical powers around the world are preparing for a face-off in Syria that could lead to World War 3. As millions of Americans tune in to see Facebook founder Mark Zuckerburg answer to Congress for his company’s handling of its users’ data, the United States’ policy of regime change in Syria has brought the country and the world closer to World War III than at any other time in modern history. Haley seemed to imply that the “red line in the sand,” which President Obama said would be another chemical attack, has already been crossed and there is no chance of the U.S. turning back on its mission to overthrow Syrian President Bashar al-Assad. Haley’s comments were quickly reinforced by President Trump’s promise to respond within 48 hours to the gas attacks—which many, including former Congressman Ron Paul, consider a false flag event. That is because U.S. politicians and the mainstream media seemed to know the details of the attack before an investigation was conducted, and they automatically held the Syrian government responsible when there is no proof to back up their claims. Standing in the way of the U.S. overthrowing Syria’s Assad is Russia, which currently has a formidable force on the ground in Syria with an untold number of aircrafts, soldiers, and mercenary fighters. Following Haley’s promise of retaliation against Assad for the still independently unverified gas attacks, military leaders from both sides are planning to meet next week. In March, RT reported that Russia’s Defense Ministry was warning that the U.S. planned to use a false flag event to justify war with Syria. No longer content to use proxy soldiers in the form of so-called “moderate Syrian rebels,” the U.S. seems poised to strike the Syrian regime and is using the latest reports of gas attacks as justification for air strikes. If the U.S. war strategy follows the same playbook it used in Iraq, Afghanistan, and Libya, a “no-fly zone” would then be established, paving the way for an American invasion of Syria. It does not seem to matter to the U.S. that there is no proof that the Syrian government carried out a chemical attack on its own people. From the time of Clark’s interview until now, there have been three U.S. presidents, each promising to end wars while on the campaign trail, and then choosing to support the Pentagon as it has steadily chipped away at each of the countries Clark listed. Iraq was taken over and its dictator was overthrown. Libya was taken over and its dictator was overthrown. Lebanon was nearly destroyed in the Lebanon War with Israel. Somalia is ruled by U.S. funded warlords, with the skeleton of a government still in place. Sudan’s government was nearly overthrown and in each of those countries, the U.S. reportedly funded rebel groups in its attempt to achieve its overall objective to weaken Iranian influence in the Middle East. Now, apparently, it’s Syria’s turn to have its Iranian-backed, Russian supported dictator overthrown. But the conflict in Syria differs vastly more than all of the other Middle Eastern countries and their military conflicts combined. Syria has the full support of Russia, Iran, and now China. The country has pledged military aid and training—which usually means troops—to Syria, who will more than likely accept its offer. American troops are already on the ground in Syria, stationed in Iraq, and maintain military bases in the United Arab Emirates. With Russia using military airbases in Iran, and the pledge of military support by China, and now with US warships reportedly steaming their way to the region, how is this not the perfect storm for WWIII? In fact, each player on the war stage set in Syria is already attacking various interests. Syria and Russia are fighting Islamic State and rebel groups. Turkey is attacking the Kurds, who are attacking rebel groups. Russia attacked Turkish troops who were attacking the Kurds. Israel just struck Iranian military targets with its warplanes inside Syria. The U.S. exhausted their use of proxy rebel groups fighting Assad before having nearly all of them driven out. And after supposedly going after ISIS targets inside Syria, the US then turned its warplanes to attack Syrian targets, whose attacks have already killed Russian troops. Not only is the stage set for WWIII but all of the actors are in a full-on dress rehearsal. Meanwhile, Americans are glued to their TV sets to see what the world’s most powerful censor, Mark Zuckerberg, is saying in defense of his country. Instead of sitting idly by as WWIII breaks out, Americans would historically be protesting yet another endless war being waged that will no doubt be carried out on the backs of U.S. soldiers. They would be in the streets protesting war instead of school safety and AR15s, much like they did in the 1960’s. But rather than getting involved in the anti-war political process—as if there’s any real influence average Americans have over the Pentagon—the public seems perfectly content hearing about how the FBI raided Donald Trump’s lawyer’s office and how Zuckerberg is wearing a suit and sitting on Congress’ hot seat.